As we saw when we reviewed the Canyon Inflite CF cyclocross bike, the German direct-to-consumer company is not afraid to try new things when designing its bikes. In the case of the Inflite CF, it was the kinked top tube for additional ’cross shouldering comfort. 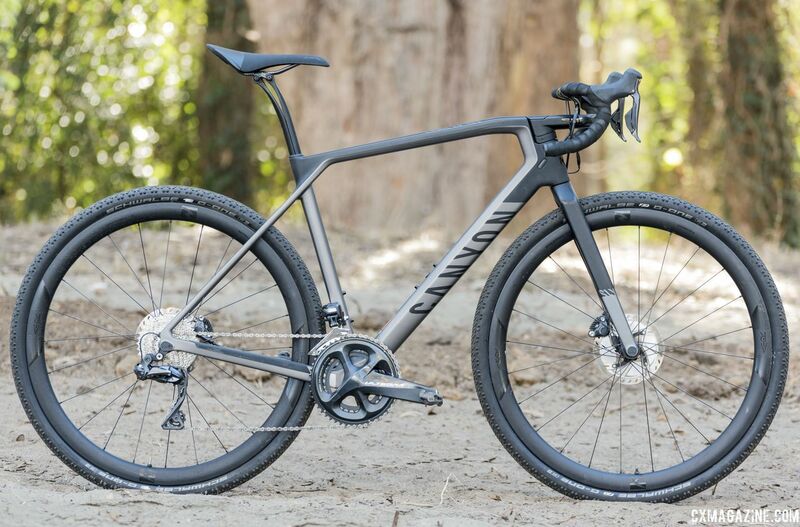 Canyon designed its Grail CF SLX 8.0 Di2 from the ground up as a gravel bike. Included in that design is a unique two-tiered handlebar. During my review riding, the first comments I got from people were always about the handlebar. They dominate the bike's aesthetic, and after riding the bike, there is certainly a lot to say about them. The carbon Grail CF SLX 8.0 Di2 bike, however, is more just an interesting handlebar. 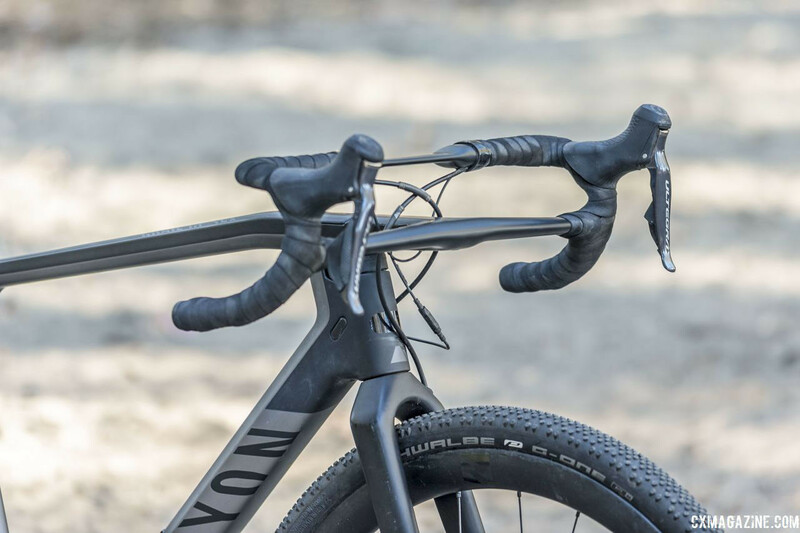 Find out if Canyon's full carbon Grail CF SLX 8.0 Di2 race bike is up to the gravel task—and yes, how the handlebar rides—in this gravel bike review. The Grail CF comes in three different carbon frames—the CF SL 7.0, SF SL 8.0 and CF SLX 8.0—and two alloy frames—the AL 6.0 and AL 7.0. The frames then come in different builds. For this review, we rode the top-of-the-line Grail CF SLX 8.0 Di2 that comes with an Ultegra R8050 Di2 drivetrain. The great thing about carbon frames is the amount of tuning allowed by unidirectional layer orientation, the number of layers, modulus of the carbon fibers and construction. I’ve often read and heard that carbon bikes have a generic feel, lacking personality or nuance. If the design is thoughtful and engineered well—as with any material—nothing can be further from the truth. Based on the ride qualities of the Grail CF SLX 8.0 Di2, Canyon elected to tune aesthetics and make a full-on gravel race bike. The Grail CF SLX 8.0 Di2 has road bike geometry that includes a 72.5-degree head tube angle, 73.5-degree seat tube angle and a 7.5cm bottom bracket drop on a Medium frame. The chainstays are 42.5cm like a cyclocross bike for tire clearance, and the frame has a total wheelbase of 103cm. In a move we like to see, Canyon designed the geometry of the two smallest sizes of the Grail CF around the 650b wheel size for better bike fit to smaller riders. The larger frames are not optimized for bigger 650b tires. Canyon posts the reach as 45.8cm, but that is to the top of the bars, not the top of the head tube axis, as is typical. The same for the 66.0cm stack that is measured to the top of the bar. If measured traditionally the reach would be 9cm shorter (36.8cm) and the stack 6 cm lower (60.0cm). The effective top tube length is 56.5cm for our Medium frame size, and the effective bar position would be equivalent to a 90mm stem. The sloping top tube allows an integrated fit with the unique handlebar. Hidden in the head tube are two nice features: a lock ring for the headset adjustment and a built-in steering limiter to prevent the handlebar from swinging into the top tube in a crash or when carrying the bike. Just like the Inflite CF, the Grail CF uses a straight 1 ¼” steerer tube (Canyon brands this “One One Four”). That, along with the stem integration into the front of the frame, disallows any stem, and hence, handlebar substitution. You can lower the cockpit by removing spacers, but you cannot set it any higher than the provided spacers allow. The slope of the top tube allows the Canyon S15 VCLS 2.0 CF split seatpost to extend out of the frame to yield maximum flex, aiding the back end comfort. A compression screw mount, not a wedge or a clamp holds the post in place with a rubber gasket sealing the post entry point. The Grail CF SLX 8.0 Di2 has two bottle mounts, as well as front and rear fender mounts. Maximum tire clearance is 700c x 42mm. We will start with the elephant in the room here: the handlebar. The Grail CF SLX 8.0 Di2’s appearance is sleek with the stem of the unique handlebar integrated with the head tube to give a one-piece appearance. The lower cross bar is level with stem, similar to a traditional drop handlebar. 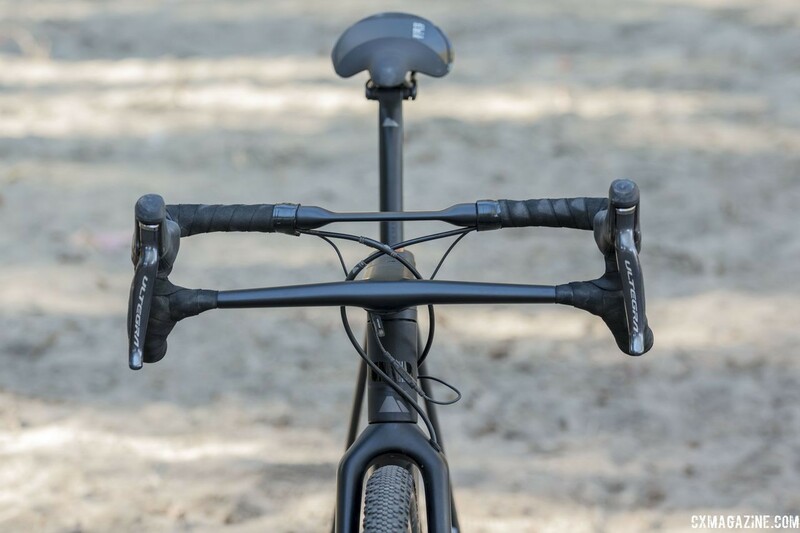 However, the cross bar connects to the functional drop handlebar at the midpoint of the curved drops, effectively elevating the tops of the bars. The design leaves the top of the functional drop handlebar suspended 5cm above and 5cm behind the stem. Canyon claims the goal of the design is to provide more dampening on the tops and hoods while maintaining stiffness in the drops. The bar itself is ergonomic with a flattened top section and a slight back sweep, shallow drop and a mild flare at the drops from 43cm at the hoods to 47cm at the end of the drops. Canyon labels the handlebar and stem combination CP07, and it comes as a complete unit. No customizing with your favorite flared gravel bar with the Grail. At first glance it appears the lower cross bar offers more hand positions like the old Scott Drop-in bars of the early 1990s, but since it is positioned so far forward, this is not the case during real-life use. More on that in the ride review. The Grail CF SLX 8.0 Di2 ships with an Ultegra R8050 Di2 groupset. The crankset included compact 50/34t gearing and the rear featured an 11-34t Ultegra 11-speed cassette. Front and rear derailleurs were both Ultegra R8050 Di2 models. 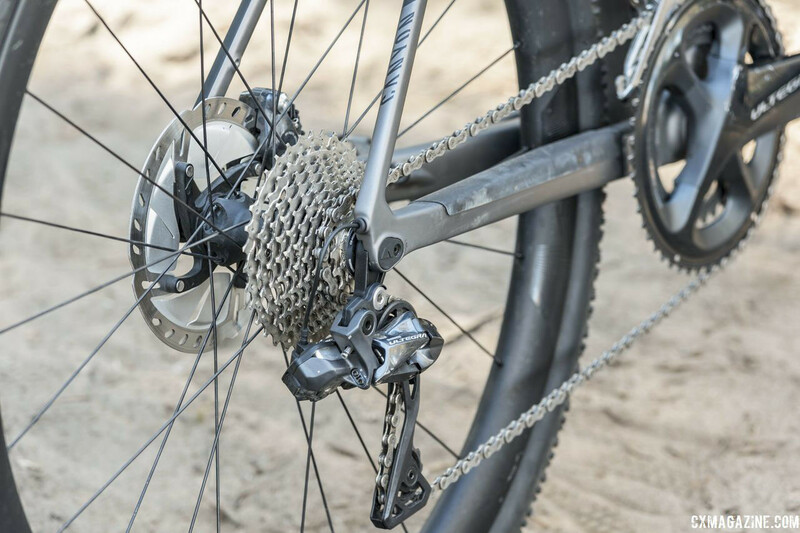 The Grail CF Di2 models have since been updated and now ship with the new Ultegra RX805 clutch-based Di2 rear derailleur. 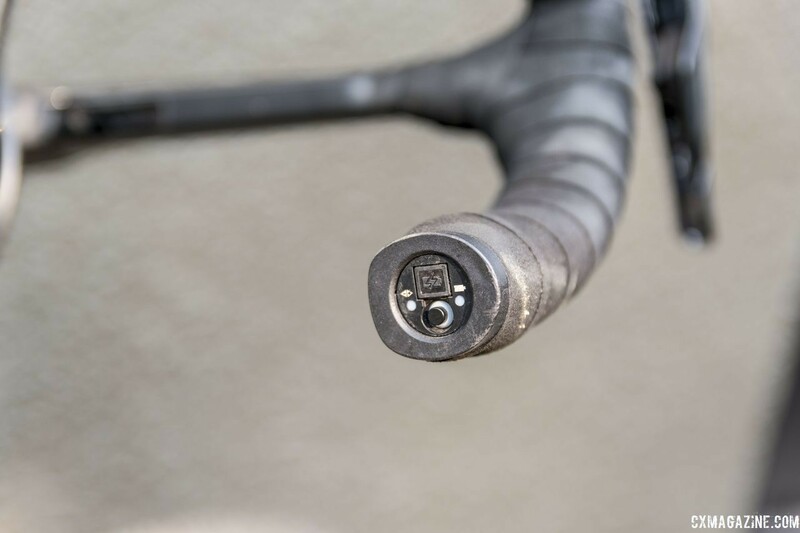 The handlebar battery has an integrated bar-end port that is aesthetically better than the junction box that typically hangs under the stem and more convenient when plugging to recharge or update the system. Part of the new Ultegra system is the 8070 Di2 hydraulic dual-control levers with a grip equal to the size of the mechanical lever. Ultegra finally has its own labeled hydraulic calipers in flat mount, and on the Canyon Grail CF SLX 8.0, they paired with 160mm IceTech SM-RT800 rotors with a large heat sink. Similar to the cockpit, Canyon's bikes require a proprietary seatpost as well. The Grail CF SLX 8.0 comes with the S15 VCLS CF carbon seat post, which features a split design similar to the Ergon CF3 intended to provide rear compliance. A replacement will cost you $320. The carbon Grail CF SLX 8.0 Di2 comes outfitted with Reynolds wheels. Our bike shipped with Reynolds ATR 700 X carbon tubeless clinchers. The 40mm-deep wheels have a wide, gravel-friendly internal rim width of 23mm. The rims are mated to Reynolds hubs with 36 points and 10-degree engagement using 24 straight-pull spokes front and rear laced 2x. Tires on our review bike were 700c x 38mm Schwalbe G-One Bite "Tubeless Easy" gravel tires that mated well with the wide tubeless-ready rims. The claimed rim weight is 446g with a claimed wheelset weight of 1,620g. The tires weighed 460g each. All told, our Grail CF SLX 8.0 Di2 bike had a total weight of 18.3 pounds (without pedals) and the frameset and components weighed 10.6 pounds without the wheels. Canyon’s design of the Grail CF is a road bike with wider tire clearance. Lengthening the chainstays and fork blades is the only difference versus a traditional road bike design. Other parameters are road-bike-like: low handlebar and bottom bracket drop and a stiff frame. 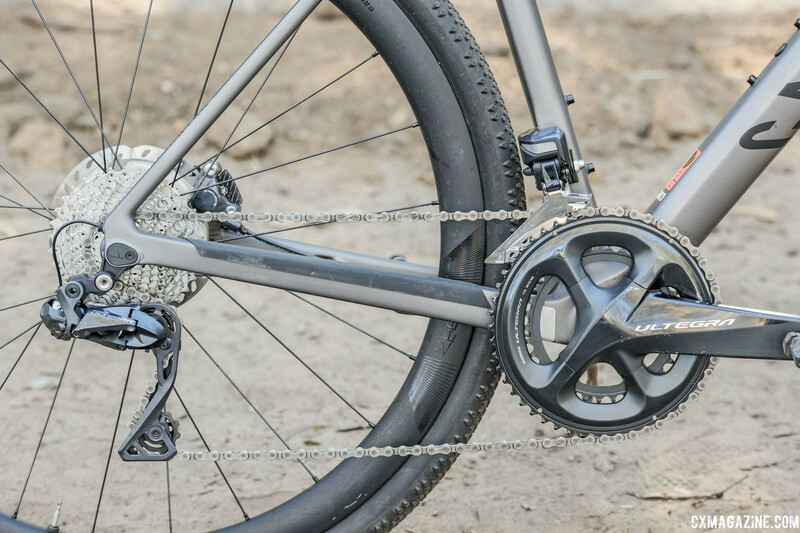 An 18-pound disc brake gravel bike setup with Di2 shifting and the medium weight wheel and tire combination indicates the frameset itself is quite light. Handling, cornering and even sprinting on the road feels great. When on the road, the only reminder that you're not on a road bike is the buzz of the fat Schwalbe tires, which do slow acceleration down a bit compared to a road setup. Wheel and tire combination can obviously affect this performance. I have a set of carbon wheels with 33mm cyclocross tubulars that I rode with the Grail CF SLX 8.0 Di2. I pumped them up to 65psi and took the bike on the road where it handled like a smooth-riding road racing bike. The extra centimeter of wheelbase was not noticeable, and the bike felt spritely and nimble. While the stiff frame makes for a fast bike, it negatively affects the bike's handling on rough roads. Even with the wide Schwalbe tires pumped to less than 20 psi, sharp elements of the surface, rocks and roots particularly, were jarring and that made the ride have a harsh edge. The frame directly reflected the smoothness or roughness of the road. According to Canyon, the goal of the Canyon CP07 Cockipit CF handlebar design is to provide comfort at the tops and control at the drops, which should help when riding those rough roads. The amount of extra flex or comfort on the tops is barely discernible, and if it is noticeable at all, it is near the untaped middle of the bar literally labeled "flex zone." On the hoods, I was not convinced there is a difference from a traditional design. The stiffness of the bike and lack of help from the stiff handlebar provided a ride that was more road-bike-like as opposed to a gravel bike with compliance. It is worth noting that I am a relatively light rider at 155 pounds, and riders who weigh more or who have more upper body strength are likely to get more compliance from the unique handlebar. One aspect of the ride I liked was the S15 VCLS CF seatpost. The split carbon design worked in providing some dampening while riding rough terrain. Rider weight will certainly play a role in the amount of flex one gets from the post, but even at my relatively light weight of 155 pounds, I found the post smoothed out the ride. Also, putting the saddle further fore or aft will also affect the flex you get from the post. The biggest general problem with the Grail CF SLX 8.0 Di2 is the non-adjustable cockpit. Although the bar shape is ergonomic with its flat top, short reach, shallow drop and subtle flare at the ends, you cannot raise the bar any higher (by flipping the stem or using one with a high angle, nor can the angle of the bars change with the integrated design. 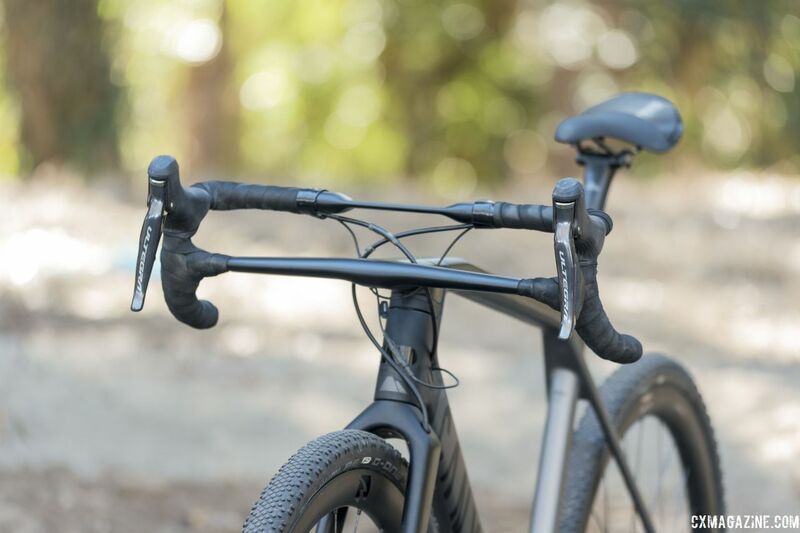 Canyon’s straight 1 ¼” steerer tube and integrated head tube disallows any other stem, and Canyon does not yet offer any alternative for length or width changes for a given bike size. I had the bike set up with the correct size frame for reach and the seatpost at my height (I'm 5'10" with a 32" inseam), and the handlebar drop from the top of a level saddle to the top of the bar's surface was 5.5cm. Preferences for handlebar height will obviously vary, but I found the Grail CF SLX 8.0 Di2 was more in line with a road bike, making riding in the drops on technical terrain uncomfortable. A more customizable cockpit would be a welcome addition to the bike. The Reynolds ATR wheels were a perfect match with the Schwalbe G-One Bite tires. The tires are indeed "tubeless easy" and the 23mm internal width of the rims allow the 40mm tires to put more tread on the ground. The small round knobs are numerous and offer traction in widely varying conditions-pavement, loose surfaces, loam and soft soil. These are not mud tires, but over most conditions you’d ride on a mixed terrain ride, the 38mm Schwalbe G-One Bite has it covered. 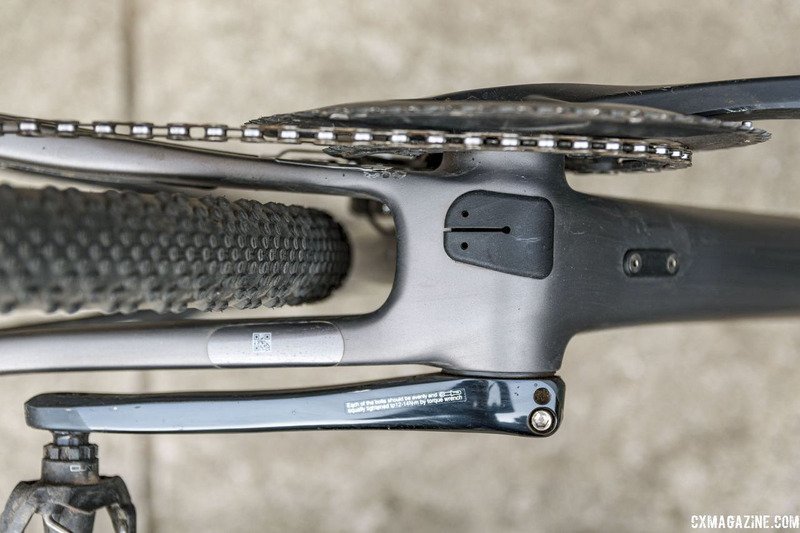 The bike came with standard Di2 shift configuration. That is, right lever rear and left lever front. The Ultegra Di2 8070 Di2 synchronized mode will shift both front and rear with one button to scroll through gears in sequential order, or in semi-synchronized mode will make a compensating rear shift automatically with each chainring shift. Though our setup was neither of those, the system program disallowed shifting to the two smallest cogs when in the small chainring of our 50/34t compact configuration. The Canyon Grail CF SLX 8.0 Di2 is a versatile, racy road bike. The bike is light and built with quality components that will have you going fast where conditions allow. The tire clearance allowed by the Grail CF SLX 8.0 Di2 puts it in the "all-road" category of gravel bikes, but we have some reservations about that classification. The inability to adjust the handlebar height of the Canyon CP07 Cockipit CF somewhat limits the off-road potential. As configured, it will work well for some riders, but the position it generally puts the rider in is decidedly road racing oriented. 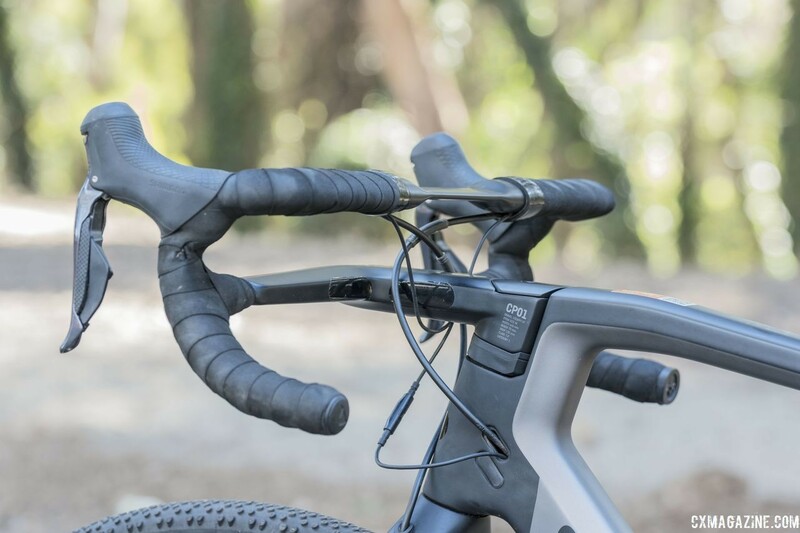 The two-tiered Canyon CP07 Cockipit CF handlebar and the split S15 VCLS CF seatpost are interesting designs for providing front and rear compliance. The seatpost worked well, while the unique handlebar did not seem to dampen rough rides as the company advertised it would. At $5,000 USD, the Grail CF SLX 8.0 is at the high-end of the carbon gravel bike market. The bike is racy, and even with the medium-weight 1,600g wheelset and a 950g pair of tires, the full build comes in at a relatively light 18.3 pounds with Di2 shifting. The utility of the Grail CF SLX 8.0 may ultimately come down to the gravel you are riding. Racing light, fast gravel? The Grail CF SLX 8.0 will perform like an all-road bike with a little bit of rear compliance. Racing rough gravel like that found at the Dirty Kanza 200? The stiff, light carbon frame may have you in for a rough, long ride in a position more suited for road racing. 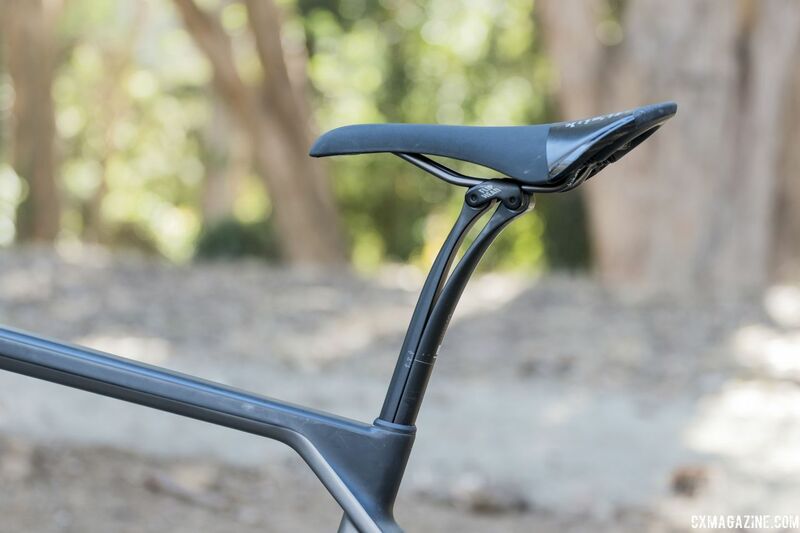 Given our issues with the set-in-place cockpit, it is worth noting that Canyon now offers the Grail AL frames with a standard handlebar and stem, which could relieve the cockpit height issue. The new Grail AL models are also cheaper, starting at $1,800 USD. For a closer look at the Grail CF SLX 8.0, see the specs and photo gallery below. Stack is to the top of the highest part of the bar? Not to the top of the stem? I really like everything about this bike except the handlebar, and since it can’t be replaced I won’t consider purchasing this bike. 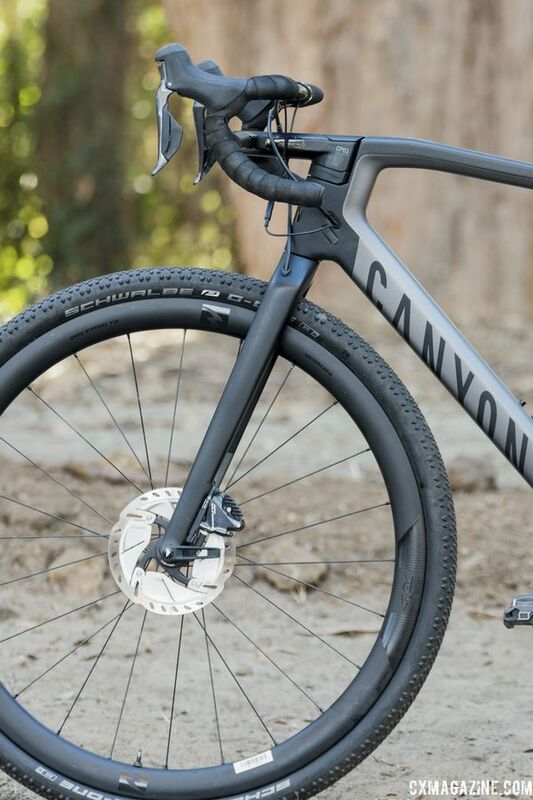 I hope that the undoubtedly poor sales of the odd design inspires Canyon to just put a normal front end on the next version.